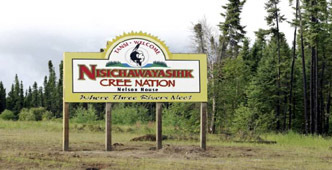 Nisichawayasi Nehetho Culture and Education Authority Inc is based in Nelson House, Manitoba, about 800 kilometres north of Winnipeg and 80 kilometres west of Thompson. The community is part of the reserve lands of the Nisichawayasihk Cree Nation - pronounced Nissy chaw why-ah seek. Around 2,900 of NCN's approximately 5,000 members live in Nelson House. Other members live in South Indian Lake, Leaf Rapids, Thompson, Brandon and Winnipeg. More than 60 percent of NCN members are between 13 and 30 years of age. In 2006, NCN signed the historic Wuskwatim Project Development Agreement with Manitoba Hydro to build the Wuskwatim hydroelectric generation project, estimated to cost $1.3 billion including the required transmission line. The agreement provides for NCN to own up to 33 per cent of the project and related revenues once project loans are repaid, along with job opportunities for qualified NCN members and business opportunities for NCN businesses and joint-venture business partnerships during construction. The 200-megawatt hydroelectric generating station is currently under construction at Taskinigahp Falls, about 40 kilometres downstream of Nelson House in NCN’s traditional territory and is expected to be completed around 2011. NCN has been training members for jobs on the Wuskwatim Project at the newly-constructed, $8.6-million, Atoskiwin Training and Employment Centre, located near O.K. School. community infrastructure programs, in keeping with NCN’s vision to sustain a prosperous socio-economic future for the First Nation. These developments include new housing, the NCN Personal Care Home, the NCN Family and Community Wellness Centre, the RCMP detachment, roads and investments in NCN-owned businesses. To learn more about NCN's community, please visit the First Nation's website, www.ncncree.com.